Need to put some meat on those diminutive delts? 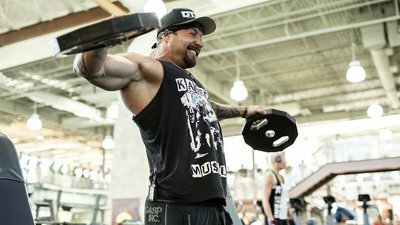 Get ready for an unforgettable pump and some crazy gains with Kris Gethin's plates-only shoulder workout! I enjoy trying new things in the gym. I especially like it when I know those things are helping me grow! A couple years ago, I started using weight plates in my shoulder workouts instead of dumbbells or barbells. I thought that, by increasing the length of the lever, I'd be putting more load and stress on my delts. Well, I was right. I feel really good about my delt development, and I want to help you do the same! If your delts are a weakness, or you find it's a muscle group you have a hard time connecting with, this workout will help. You'll feel a huge amount of activation in your shoulders, and you'll walk away with a pump so powerful you'll have a hard time fitting out of the door. Ready to work? Let's grow. I've had some shoulder trouble in the past, so I always warm up my rotator cuffs before my shoulder workouts. I want to prevent any further possible damage. Perform the first exercise facing down with your torso against an incline bench. Supporting your chest will help you isolate your rear delts and prevent you from using other muscles to move the weight. When you're done with the chest-supported raise, move directly to a bent-over raise. Try to keep forcing your arms wide. You'll be able to feel the weight at the very end of your arms. They weight doesn't have to come very high to stimulate your rear delts. After you finish the first set, start sipping on your intra-workout or whatever supplement you use during your workouts. Start the first exercise by leaning against a wall. I don't want you to use your lower back to move the weight, and keeping it against the wall should take it out of the equation. Try doing raises with both arms at the same time. If you hit failure before you reach the desired rep count, do single-arm raises. For the second part of your superset, stand as you normally would—away from the wall—and perform front raises. You can use a little body English when you're moving the weight, but keep it under control. As you fatigue, you may have to grab lighter plates. That's fine, but make sure you're still doing good reps.
A lot of people neglect their front delts because they think pressing movements like the bench press and overhead press are enough. I don't believe that's true. Focus on developing the anterior delt, and you'll see more front-to-back thickness in your shoulders. If you're unable to perform the necessary reps with more than 10-pound plates, do the reps as strictly as you can—by focusing on a slow tempo and complete control, you can make these raises more challenging without even jumping up in weight. When you get strong enough, try to get at least one set with the 25-pound plates. Before each set, close your eyes and take a few deep breaths. Get your brain into the muscle before you start moving it. In the first two supersets, you hit the front and the back portions of your delts. Now, it's time to hit the middle. Perform your first set of lateral raises sitting. Sitting helps to isolate the muscle group because it's much harder to use any other muscle to help move the weight. For the second exercise in the superset, stand up so you can activate additional muscle groups to move the iron. Try to hit failure on both exercise variations. As you're performing these movements, don't let your wrists bend. Keep the weights out as wide as you can and maintain a strong, flat grip on them. Again, if you need to grab lighter weight as you go, you can. This may look like a funny movement, and it really is, but it makes my shoulders scream! Keeping your arms slightly bent and your wrists, elbows, and shoulders in a straight line, move the weight from the front of your body to the side, almost like you're doing a band pull-apart. It shouldn't take you more than 20 or so reps to hit failure with this funky move. Once you do, perform lateral raises until you hit failure again. Then, do the delt fly for another 20 or so reps to failure, and then perform front raises until you hit complete failure. The point of this superset is to annihilate your delts. Choose weight that's heavy enough to ensure that happens—without comprising your form, of course. Now that your delts are feeling like they can't get any more pumped, you'll do some presses. (Barbaric and brutal, I know.) I like pressing after all this shoulder work because I don't have to use very much weight. I usually use 45-pound plates for the shoulder press, but you can use whatever weight you know you can get for about 8-12 reps. When you've hit your reps or reached failure on the seated press, stand up and press some more. If you need to use a little knee drive to get the weight over your head, you can, but remember that your delts should be your primary focus. As you go through this workout and start getting fatigued, you may begin to doubt yourself. You may even start to feel like you can justify some complacency and give up early. I'm telling you right now that stopping early or doing fewer sets than prescribed is nothing but mental weakness. Treat every set like it's the last one you'll ever do. Perform each rep with a sense of urgency. What you're doing in the gym should be the only thing on your mind; it needs to matter. Otherwise, what the hell is the point? Now, grow.